Aqua Adventure provides lifejackets at no additional cost to our guests. Guests may bring in their own Coast Guard approved lifejackets. Please keep in mind that lifejackets are not approved for use on body or tube slides. No outside floats are allowed in the park. The only exception will be “puddle jumpers” and inflatable baby floats with direct parental contact. The floats must have a seat and no hard surfaces. Aqua Adventure lifeguards are licensed through Ellis & Associates, the leading comprehensive aquatic risk management program in the water park industry. 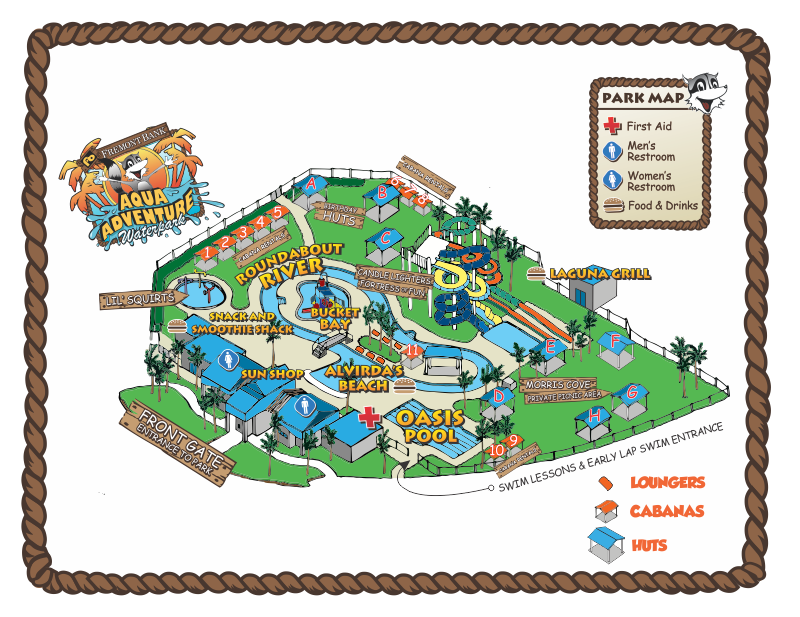 Ellis & Associates provides training to 90% of the water park facilities in the United States. When it comes to aquatic safety, Ellis & Associates sets the standard with its 10/20 Second Protection Standard, the worldwide benchmark for proactive swimmer standards for lifeguards and facilities. Ellis & Associates is able to achieve this through rigorous auditing standards for client facilities. At any time, an auditor can watch a lifeguard without his/her knowledge to test real life incident management scenarios. This approach is aimed at preventing an incident before it happens, rather than just responding after one occurs. Since Aqua Adventure opened, it has consistently ranked amongst the top water parks in the nation. The First Aid center is located by the Oasis Pool. It is always staffed with a trained team member and a Certified EMT is on duty during park operation to ensure the safety of the guests.